Now that I'm living abroad, I spend most of my time on buses and metros listening to podcasts. My earbuds are constantly rockin' offerings from PRI's The World, NPR, CBC, and even, The Bugle . [Full disclaimer: I do freelance reporting for The World, NPR and CBC.] But, there are times when you want live radio—when you want to know what's going on right now. Until today, I've made do with the free apps provided by KPCC (Los Angeles) and Minnesota Public Radio, which offer live streams of their stations. It's been a pleasure to walk around France listening to live American radio, even if it is over an EDGE connection. But what if I want to listen to my homestation KQED (San Francisco), which doesn't have a live streaming app? 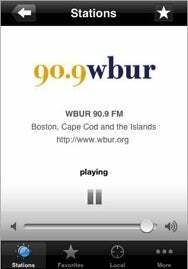 Or check out the offerings of WBUR (Boston)? My prayers have been answered! Enter: Public Radio Tuner. It gets better, though! There's a bunch of NPR programming (namely Morning Edition and All Things Considered) that's NOT available as a podcast isn't easily available to me any other way. Another enterprising iPhone developer came out late last month with NPR Mobile, a new app that allows you to search for stuff in the NPR archives, and listen to individual stories on every NPR show, including ATC, and even A Prarie Home Companion. Both are free. You can thank me later.